The markets were kept busy last week with a host of economic reports. The Federal Reserve held its monetary policy meeting where interest rates were left unchanged. The Fed signaled that it would remain patient when hiking interest rates. Data from the Eurozone showed that inflation continued to slow significantly during the month of January according to the flash estimates. Manufacturing activity in the Eurozone remained subdued. The week ahead will see mostly second tier data that covers the German and French final services PMI followed by the Eurozone’s services PMI as well. Data from the U.S. is packed for the week ahead. Key data over the week includes the ISM’s non-manufacturing PMI as well as the advanced fourth quarter GDP report from the U.S. The U.S. economy is expected to slow in the fourth quarter of the year. Durable goods orders report and the delayed retail sales report will also be coming out on Wednesday. Data from Japan and Switzerland is relatively quiet for the week ahead. 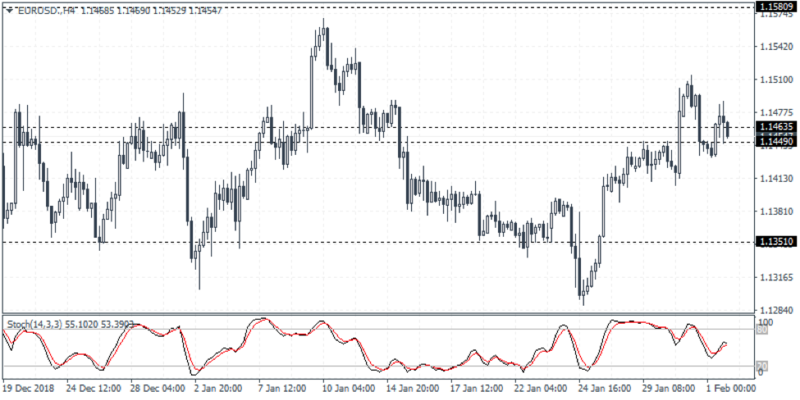 Chart set up: The EURUSD currency pair continues to remain trading flat overall. Price action continues to bounce off the lower support level near 1.1351 to test the resistance level at 1.1463 – 1.1449. The euro managed to briefly rise above the resistance level only to slip back below this level by Friday’s close. The euro currency is expected to maintain the range over the medium term which means that price action could continue bouncing off the highs and the lows within the support and resistance level that has been established. In the near term, any declines could be seen retesting the lower support at 1.1351 level in the short term. To the upside, if we see a rebound off the current resistance level, then the common currency could be seen attempting to test the next main resistance at 1.1580. For the week ahead, the EURUSD currency pair is expected to be flat.